DD Form 2400 or the "Civil Aircraft Certificate Of Insurance" is a Department of Defense-issued form used by and within the United States Army. The form - often mistakenly referred to as the DA form 2400 - was last revised on January 1, 2008. Download an up-to-date fillable PDF version of the DD 2400 down below or find it on the Department of Defense documentation website. Please read Privacy Act Statement and Instructions on back before completing. PLEASE DO NOT RETURN YOUR FORM TO THE ABOVE ORGANIZATION. SEND COMPLETED FORM TO THE ADDRESS IN NOTE 2 ON BACK. insured's use of any military installation or facility. is sent, regardless of the effective date specified therein. accordance with items 8c and d.
AUTHORITY: 49 U.S. Code, Section 44502(d). or corporation that operates civil aircraft at military aviation facilities. operate civil aircraft into military aviation facilities. This form is to be completed only by the insurer or authorized representative. 1. Complete all applicable items. Continue below if additional space is required. 3. 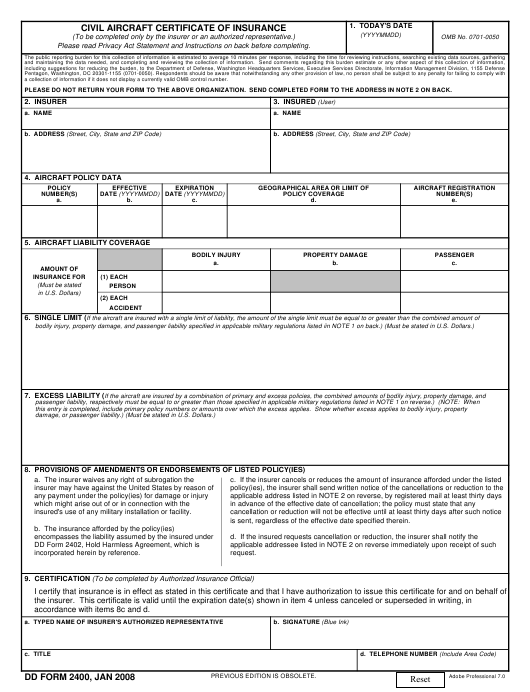 This form is available under DefenseLink, Publications.